The first thing to realize is that this is a legal term, not a scientific one. This is not a term that scientists use when doing risk assessments or testing the safety of drugs. So right off the bat, we have a huge problem because this argument is conflating legal terms with scientific ones (I’ll return to that at the end). So what does this legal term actually mean? Basically, it means that there is nothing that can be done to make the product safer without compromising the function of the product. The term comes from the legal document, “Restatement (Second) of Torts, Section 402A,” and it is about protecting manufacturers from frivolous law suits, not about providing consumers with health information. The basic idea is simply that companies cannot be held accountable for an injury that arises from unavoidably unsafe products because there was nothing that the company could have done to prevent that injury (inherent in this term is the requirement that the product was manufactured correctly, labelled correctly with adequate instructions for how to administer it, etc.). Let me give you an example of what that means. The term is generally not applied to food, but if it was, peanut butter could be considered unavoidably unsafe, because some people have allergic reactions to peanut butter, and there is nothing that a peanut butter company can do to prevent that. In other words, there is no way to manufacture peanut butter without that risk being present. Thus (assuming that the product was manufactured and labelled correctly), a peanut butter company would not be liable if someone had an allergic reaction to the peanut butter, because that reaction was not the result of manufacture negligence. Now, does that mean that peanut butter is dangerous? No, obviously not. For the majority of us it is perfectly fine. “Unavoidably unsafe” does not mean that a product is dangerous and should be avoided. Rather, it simply means that are risks that cannot be removed. When we apply that to vaccines, we see the same thing. Vaccines have side effects. No one has ever denied that, but serious side effects are rare, and the benefits far outweigh the risks. Indeed, Section 402A specified that “unavoidably unsafe” products should have benefits that outweigh their risks. 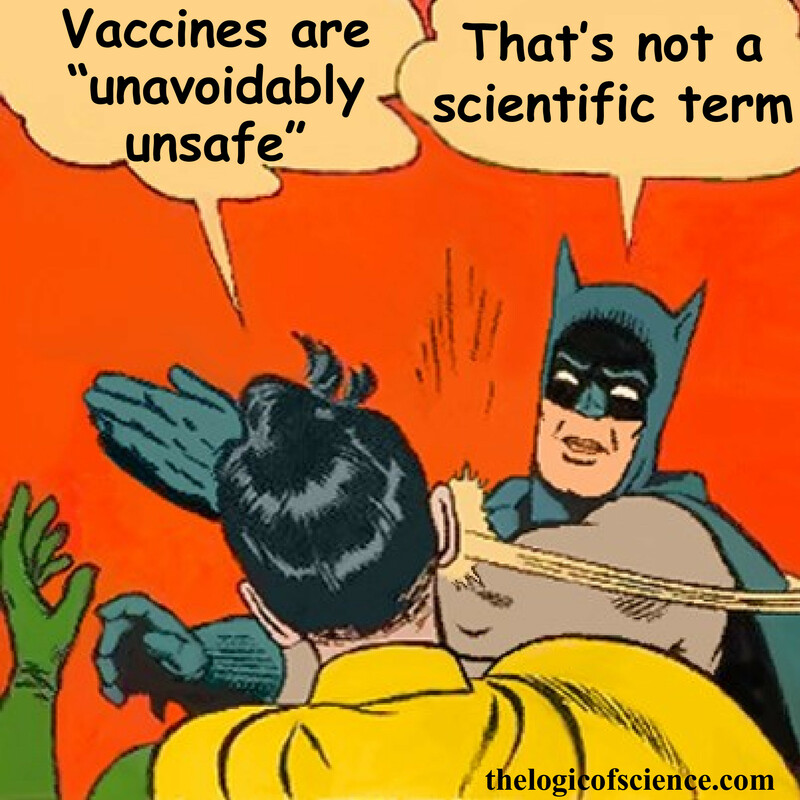 So labeling vaccines as unavoidably unsafe absolutely does not mean that they are dangerous and should be avoided. It simply means that there are risks that are not manufacture’s fault. Also, just to be 100% clear here, everything has risks, including the decision not to vaccinate. People often focus on the risk of taking an action and ignore the risk from not taking that action, but a correct risk assessment has to consider both, and for vaccines, the risk from not vaccinating is much higher than the risk from vaccinating. Finally, I want to return to me previous comment about this being a legal term not a scientific term. Those who deny science frequently like to cite courts, legal documents, etc. as evidence of their position, but that is simply not how science works. Even if a legal body like the Supreme Court had said that vaccines are dangerous, that would not be evidence that vaccines are dangerous. Lawyers and judges are not scientists. When they make a statement about science, they are stepping outside of their area of expertise. Further, even if they were scientists, that wouldn’t turn what they say into a fact. In other words, when they say something it doesn’t automatically become true. Whether or not something is a fact has to be determined by conducting studies. That is where scientific evidence comes from, and scientific studies overwhelmingly support the safety and effectiveness of vaccines. Trying to use a legal ruling as evidence against scientific studies is foolhardy. It is also pretty ironic and hypocritical for anti-vaccers (a group that is notorious for distrusting the government) to cite a government ruling as if it gives them a checkmate. In short, “unavoidably unsafe” is simply a legal term that means the manufacture is not liable because they cannot do anything to make the product safer. It does not mean that the product is dangerous and should be avoided. Note: Some pedants may take issue with the way that I have been using the term “dangerous” and, admittedly, even some documents about “unavoidably unsafe” products use it in a way that is inconsistent with how we usually use the term. So, when I say “dangerous” I mean a product or activity with a high enough chance of causing harm and low enough benefits that it should be avoided. That does not mean, however, that there is no chance of something “safe” causing harm. Swimming, for example, is not something that I would usually consider “dangerous” even though death is possible. Swimming during a thunder storm, however, I would consider dangerous. See the difference? Schwartz. 1985. Unavoidably unsafe products: Clarifying the meaning and policy behind comment K. Washington and Lee Law Review 42: 1139–1148. I do want to point out that in the case in question – Breusewitz v. Wyeth – the Supreme Court rejected the unavoidably unsafe argument in a 6 to 2 decision. I don’t think that is correct. The parents who brought the lawsuit argued that the side effect was avoidable and, therefore, the company was liable, but the court ruled in favor of the company (i.e., concluded that it was unavoidable and the company was not at fault). I admittedly haven’t read all the court documents from that case (I focused on legal documents concerning the term itself for this post), but from the news reports I have read of the case, it certainly seemed that the court upheld the “unavoidably unsafe” label. As you point out, unavoidably unsafe is a legal term of art. It has a specific meaning (and it’s a very badly chosen term for that meaning). That specific argument was, in fact, rejected. “unavoidably unsafe” rolls off the tongue better than “inherent benefits and risks” when describing a medical device/procedure/treatment. We enter the realm of the tragedy of the commons when enough folks opt out of the risks and still attempt to benefit from herd immunity that is undermined by their action. Thank you for the information. I have slightly edited the opening sentences to try to avoid further confusion. Nor did the Supreme Court actually rule on whether the side effect was unavoidable. The question before the court was a specific legal issue: does the unavoidably unsafe category mean that some cases of design defects can be litigated in state courts? The court said no. It was not, actually, addressing whether this specific product was badly designed. excellent and clear presentation. Yes, vaccines generally good for the general population, special subsets of population with known reactions or certain medical history have reason to be cautious. Herd immunity is good for all of us. Vaccines are hard on a very small number of the vaccinated population and that is hard to avoid given the physiological mechanism of the process. Logic and science also good.